What happens when you can’t search with Doomsday? 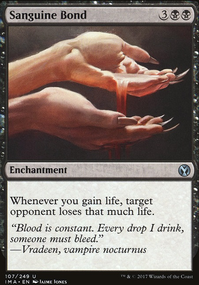 Love the Extirpate , I'm currently testing Shadow of Doubt probably for the same reason. If you add black you could pull some Assassin's Trophy + Shadow of Doubt shenanigans, could be fun! I also want to suggest Dream Eater instead of the cockatrice, it makes up for the 1 mana by setting up your next turns. Neat deck! Oh man I've wanted a Bitter Ordeal for a while but never thought of that line, just thought of doing a big one post wrath. That's awesome! 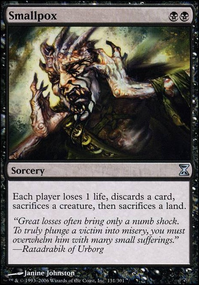 I thought about copy artifact but didn't think it was really complimentary to the deck at first. I suppose you could copy an opponent's aetherflux or mirari which would be cool. 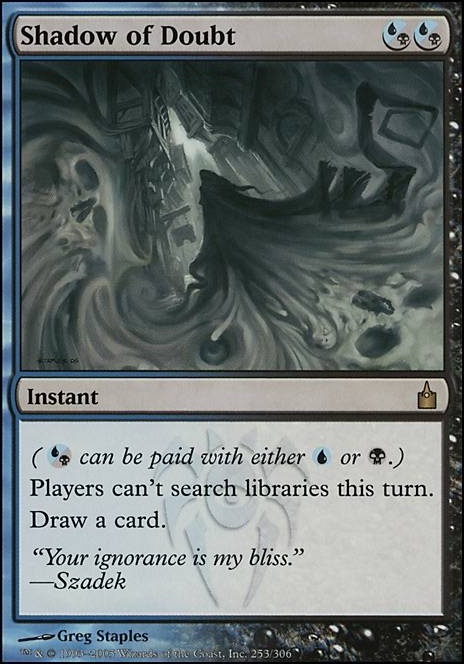 I wanna try to include more "cantrip control" cards like Dismiss and Shadow of Doubt too as a big problem i've found is counters not replacing themselves. Technically it's a mixed variant, I can potentially win within T3-4 if I so choose to but it's more risky that way as I won't have built up enough resources to protect by winning line. To be specific it's a mid-range Ad Nauseam built where if it ever resolves during any mid-game the probability of winning is about 90%. The key point is having Kess on the battlefield and use her as a recurable resource, I didn't go storm route because if I did I would actually change up the deck list and be going towards a Bonus Round route and use different types of rituals ex. Rite of Flame / Pyretic Ritual / Desperate Ritual . 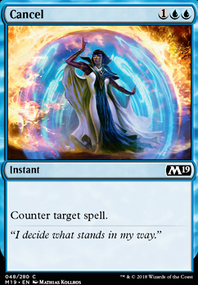 Paradoxical Outcome is great in any storm deck, just doesn't fit the bill for me as I am running an Ad Naus curve, especially since I am running Dark Petition in the deck since I don't own another Imperial Seal yet. Life management is huge for me as I am pretty known as the threatening player so aggro always come at me first plus a majority of our board wipes in these colors rely on life ( Fire Covenant / Toxic Deluge ). That being said I do contemplate time from time in adding in Pyroclasm or even Volcanic Fallout . Also yes, Shadow of Doubt has been one of my tech cards that is super lit, literally tells someone NO. Although you have to be careful as you can't tutor as well until end of turn. kudos on Shadow of Doubt for sure though. Thats going in my build. I gotta post that list at some point. Thanx for contributing to the community. 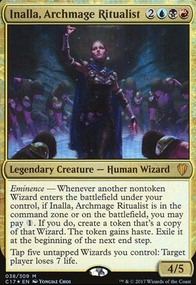 DiverDown: Personally I like Stifle more in that role: it can hit the T1 fetchland, where Shadow of Doubt only hits on T2, and also has additional utility against a lot of combos etc. Although it doesn’t do as much against Demonic Tutor , i’ll acknowledge. @DiverDown all of my decks are at the optimized level and they are still competitive but not oppressive. I feel like though it's not only about the deck but also the play style, for instance I play my Scrapyard Wars! ft. Daretti is a VERY good deck and RARELY loses, but... I don't go for the win right away ever. I like to do silly combos and test the limits of what I can do with my deck, before going for the guaranteed win. I think the best way to tone down the power level is remove all but maybe one infinite combo (not one that win's the game), and play cards that just synergize well. 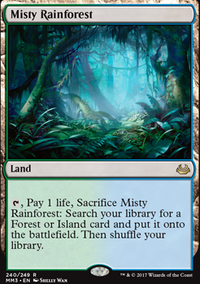 Also don't make the entirety of the deck focused on ONE wincon and getting to it, give yourself a few wincons. 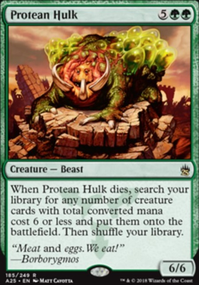 Lastly jank is king of the castle in casual edh, make winning hard for yourself and when you do win everyone can't help but go "Holy crap I can't believe you won that way!" Next I'd like to post me deck for your advice friends! Remember demon tribal, flood the board with big dudes as fast as possible and kill your opponent with value, that's the goal here.